The Hans Hoyer K10 F/Bb Double horn is the newest innovation for the orchestra. 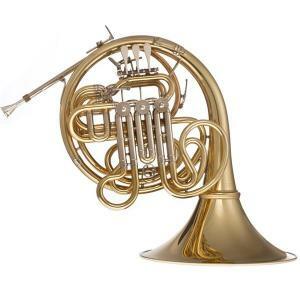 The design was developed in close cooperation with Markus Wittgens, Principal horn in the Gurzenich Orchestra in Cologne and is a member of the Bayreuth Festival Orchestra. The K10 has a well-orchestrated middle range and a greatly responsive low register. An unknown ease in the higher area is obtained with a light rotary valve set., a full-flow switch valve, and an individually adjustable mouthpiece receiver – a pleasant, well-balanced set up for any professional.